"Sampath Speaking" - the thoughts of an Insurer from Thiruvallikkeni: Scotland beats England at Edinburg ! The Grange (originally St Giles' Grange) is a suburb of Edinburgh, about one and a half miles south of the city centre. It is a conservation area characterised by large late Victorian stone-built villas, often with very large gardens. Many have now been sub-divided into flats, with further flats often being built on the grounds. Edinburgh is the capital city of Scotland. Recognised as the capital of Scotland since at least the 15th century, Edinburgh is the seat of the Scottish Government, the Scottish Parliament and the supreme courts of Scotland. The city's Palace of Holyroodhouse is the official residence of the Monarchy in Scotland. The city has long been a centre of education, particularly in the fields of medicine, Scots law, literature, the sciences and engineering. 7 - Batsmen have more than four 140-plus scores in ODIs. Sachin Tendulkar leads with 12, Rohit Sharma has seven, while five batsmen have five each. Among the batsmen with four 140-plus scores are ODI legends like Viv Richards, Brian Lara, Ricky Ponting and AB de Villiers. Calum Scott MacLeod has 4 and it is unlikely that you would have known him. Two centuries in succession for Calum MacLeod in January 2014 - a 62-ball 113 against the UAE and 175 against Canada - played a major part in Scotland's qualification for the 2015 World Cup. 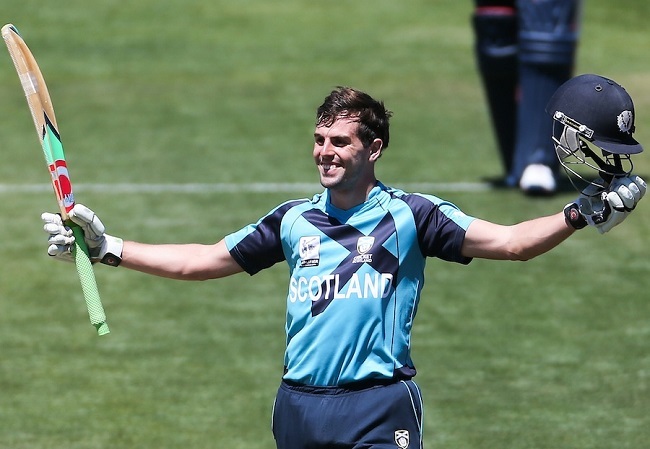 In many ways MacLeod is a surprising poster boy for Scottish cricket. He has roots in the island of South Uist in the Outer Hebrides, from where his grandfather moved to Glasgow. When he acted as a substitute fielder for England in an Ashes Test in 2009 he became the first Gaelic speaker to appear in a Test. They are celebrating their win over England in ODI at Edinburgh. Scotland's final-wicket hero, Safyaan Sharif, said that his team's actions spoke louder than any words could, as they marked their return to competitive action after the heartbreak of World Cup elimination with a historic, and nerve-shredding, victory over England at The Grange. Scotland 371 for 5 (MacLeod 140*, Coetzer 58 Munsey 55) beat England 365 (Bairstow 105, Hales 52, Watt 3-55) by six runs.. .. .. the total is the highest by any Associate team in ODIs. The previous highest was Kenya's 347 for 3 against Bangladesh in 1997. Scotland's previous best was 341, against Canada in 2014. In matches between an Associate and a Full Member team, the next highest is Ireland's 331 for 8 against Zimbabwe in the 2015 World Cup. On the eve of Scotland's fifth-ever ODI against England, coach Grant Bradburn talked about "hunting history". Even though England arrived at the Grange as the top-ranked ODI side in the world, Bradburn said England had to lose to Scotland eventually, "so why not Sunday?" Bradburn's question was answered affirmatively, emphatically and dramatically in a six-run win. Through much of the day it was hard to tell which team held the No. 1 ranking. After losing the toss and being sent in, Scotland posted 371 for 5, the highest ODI total ever by an Associate country and the fourth-highest ever conceded by England. Calum MacLeod became the first Scotsman to score an ODI ton against England, finishing unbeaten on 140 just three months after carving up the world's top limited-overs spinner, Rashid Khan, for an unbeaten 157 at the World Cup Qualifier. Scotland's biggest ODI stand for any wicket against England was the first record of the day to fall, previously 86 between Gavin Hamilton and Kyle Coetzer in 2010. That went down inside of 13 overs thanks to the brisk start from captain Coetzer and Matthew Cross. The pair were especially belligerent against David Willey, who gave up the first boundary of the day to Cross cutting through point in the second over and proceeded to get a beating throughout the Powerplay, eventually ending the day with 0 for 72. Nearer home, Sri Lanka hurtled to defeat either side of lunch on the final day, losing the last five of their wickets within 25 deliveries, for eight runs, as West Indies went 1-0 up in the three-Test series. The telling blow had been struck earlier in the day, by Shannon Gabriel, who has been outstanding in this Test. He pitched a ball just short-of-a-length to centurion Kusal Mendis, got the ball to erupt, and drew the outside edge. Though for much of the morning, wicketkeeper Shane Dowrich had been collecting balls at knee height or below, so menacing was this delivery, that he had had to complete the catch with arms outstretched over his head.